Our bulk foodservice Mushroom soups are used often as a base for many restaurant meals and dishes. Cream of mushroom soup can be served ala carte on a salad bar or used in baking. Mushroom soup can also be used to make custom culinary dishes such as chicken marsala. We carry every different type of commercial soup available for restaurants and foodservice companies. Campbell's Cream Of Mushroom Soup 10.75 Oz. 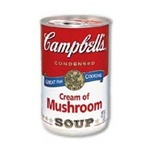 Campbell's Cream Of Mushroom Condensed Soup 50 Oz. 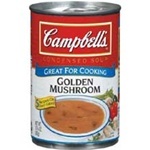 Campbell's Healthy Request Cream Mushroom Soup 50 Oz. Campbell's Ready To Serve Easy Open Cream Mushroom Soup 7.25 Oz. 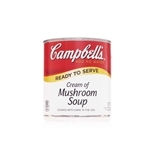 Campbell's Ready To Serve Low Sodium Cream Mushroom Soup 7.25 Oz. Campbell's Red and White Golden Mushroom Soup 10.75 Oz. Heinz Cream Of Mushroom Soup - 50.5 Oz. Unilever Best Foods Legout Cream Of Mushroom Condensed Soup 50 Oz. Vanee Foods Condensed Cream Of Mushroom Soup - 50 Oz. Mushroom Sauce - 50 oz. Bulk Mushroom Soups are used in many different restaurant applications such as buffets and soup bars as well as used to make custom sauces and dishes. Campbells and heinz are the 2 biggest soup manufacturers in america. We also sell bulk mushrooms for asian restaurants. Just throw some of this soup over rice for a quick, great meal for the kids.